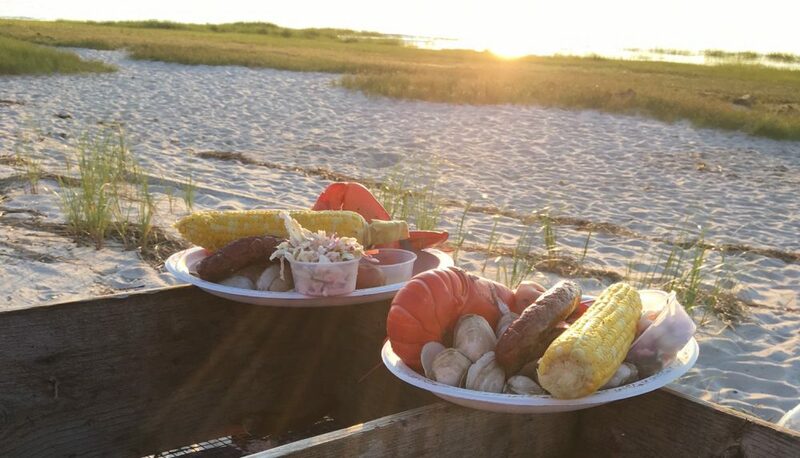 The O’Rourke family has been doing clambakes on Cape Cod since 1980. Jake O’Rourke started Jake’s Bakes while “in-between” restaurants. Jake’s Bake’s became so popular that Jake just kept doing clambakes year after year with many repeat and new customers. Although, Jake is no longer with us his wife Ann and son Dan still run the business each season. So all you have to do is decide between our menu choices. The day of the clambake or BBQ our crew will show up and steam your very own clambake at your site. We provide everything you need. Heavy stock paper plates, forks, knives, spoons, napkins, lobster crackers, we’ll bring it all. We will even haul away all of your lobster shells and trash. Check out our menu for 2017 prices. We require a minimum of 20 people. Anything less can be delivered. We start with Steamers and chowder broth and butter, then your clambake. Finish with fresh cut water melon or our “made that morning” strawberry shortcake. If you don’t like lobster you can substitute a 12 oz NY sirloin steak, just let us know ahead of time. We can be in and out in as little as 2.5 hours, you’d never know we were there! Everything is made fresh and to order. If you need tables and chairs or any other party rentals we can handle that for you as well. Raw bars, kids menu, just ask. We are ServSafe certified and fully insured.